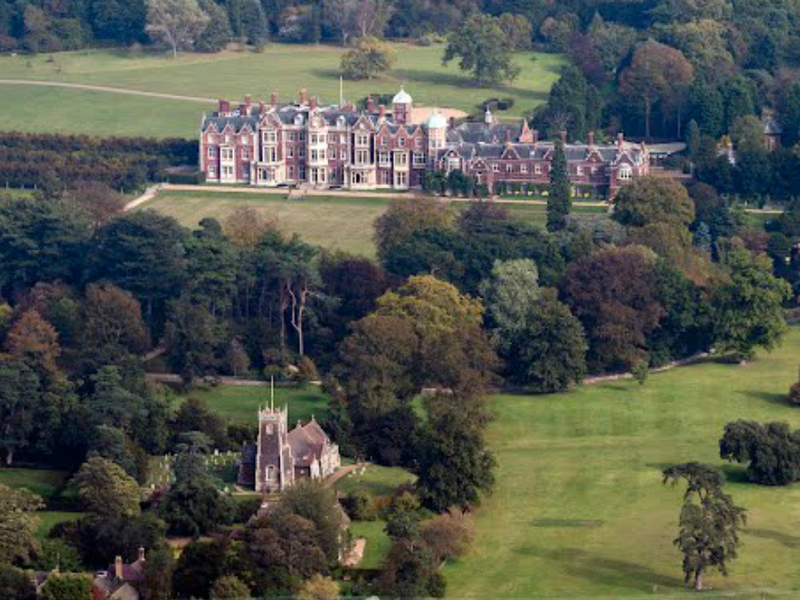 This morning the British Royal Family attended the traditional Christmas Day service at St. Mary Magdalene Church on the Sandringham estate. 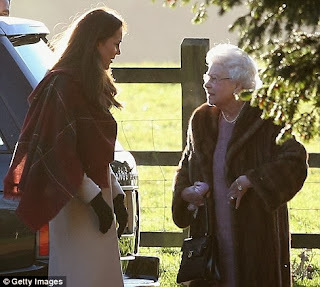 The perfect chance for us royal watchers to take a peek at the Royals' outfit choices - and of course this year the Duke and Duchess of Cambridge with baby Prince George joined the rest of the Royal Family in celebrating Christmas at Sandringham (more on last year's Christmas festivities can be found here). So, without further ado, let's have a look at what Kate (and everyone else!) wore. Early this morning, the Royal Family gathered to take communion. Below we see the Princess Royal, the Duchess of Cambridge and the Queen (in a rare public appearance wearing a fur coat). The Duchess was wearing the same cream wool coat she debuted earlier this year at the wedding of Mark Tomlinson and Laura Bechtolsheimer in Arosa, Switzerland and a tartan shawl in festive shades of red and green. 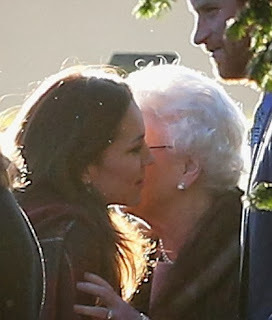 The Duchess and the Queen can be seen greeting each other with a kiss while Prince Harry looks on. Awww! 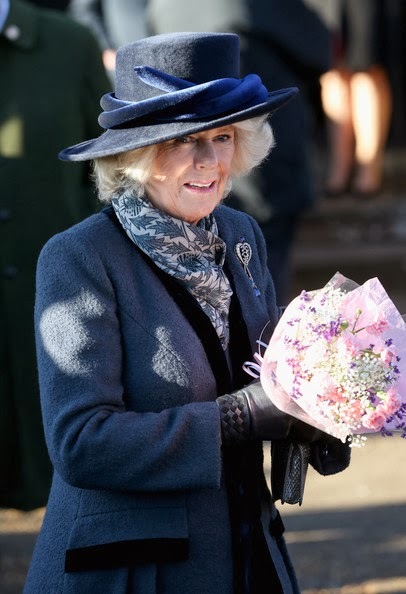 Later in the day and after a change of clothes, the Royal Family was back at the church for the 11 a.m. service conducted by the rector of Sandringham, Jonathan Riviere. 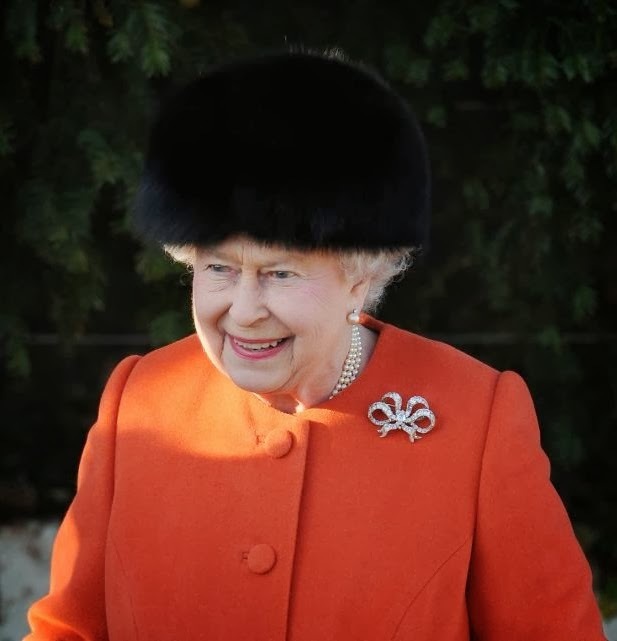 The Queen was in a burnt orange wool coat by Stewart Parvin, black fur hat with matching black fur-trimmed gloves and one of Queen Victoria's bow brooches (made by Garrard & Co. in 1858 as a set of three) to add sparkle. 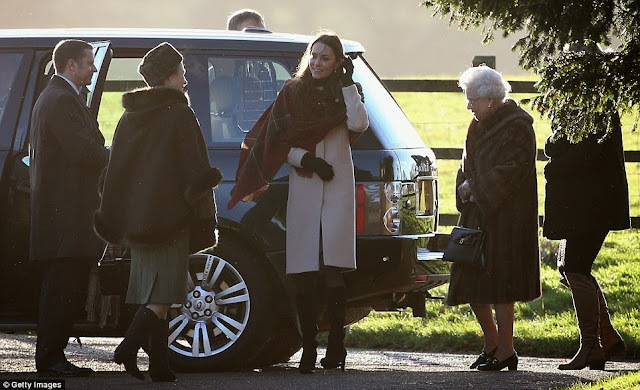 The Duchess of Cambridge wore a forest green felt hat by Gina Foster and repeated her Alexander McQueen Black Watch tartan coat dress, first seen on a visit to her old school, St. Andrew's Pangbourne, in November last year. 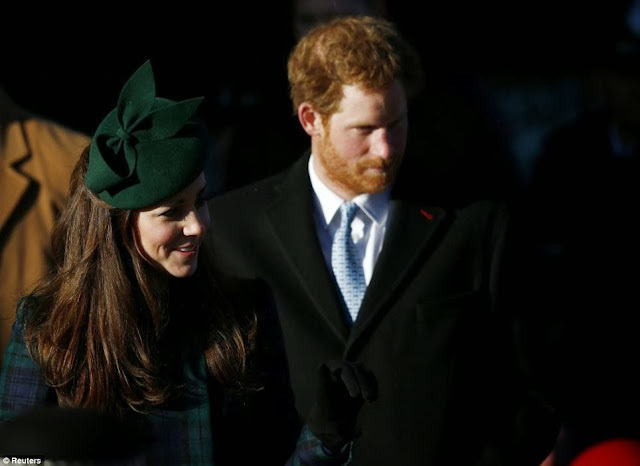 She was also wearing her Kiki McDonough green amethyst earrings (believed to be a 2011 Christmas present from Prince William) and a pair of black gloves with bow. 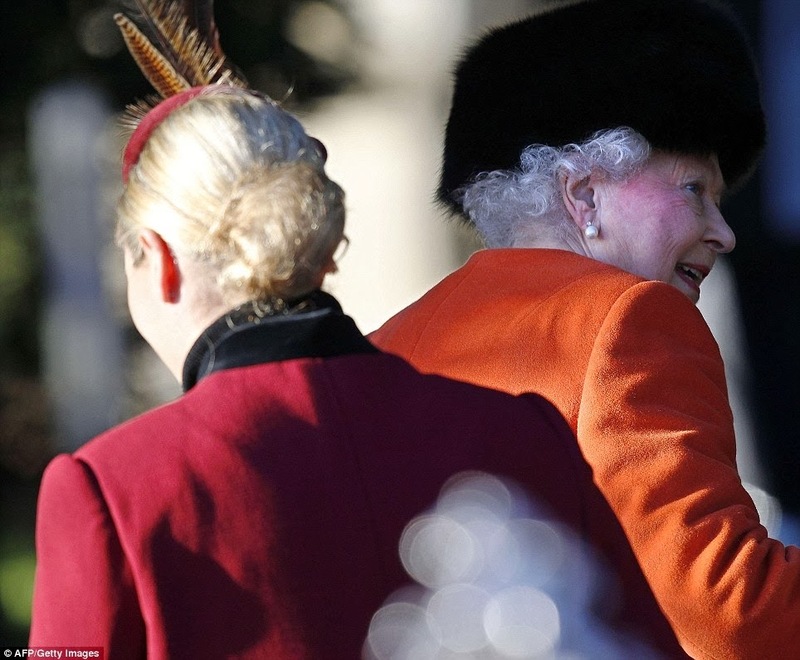 Zara Phillips (seen above with Princess Eugenie) was also in attendance, baby bump warmly wrapped up in a red coat with matching feathered hat. Princesses Beatrice and Eugenie of York. Afterwards, at 3 p.m., it was time for the Christmas message from the Queen, a tradition that dates back from the times of her grandfather, King George V, who broadcast the first Christmas speech in 1932. The Queen addressed the nation from the Blue Drawing Room at Buckingham Palace, wearing the same primrose yellow dress by Angela Kelly she wore at the wedding of William and Kate in 2011 and the flower basket brooch which was a present from her own parents on the birth of Prince Charles in 1948. 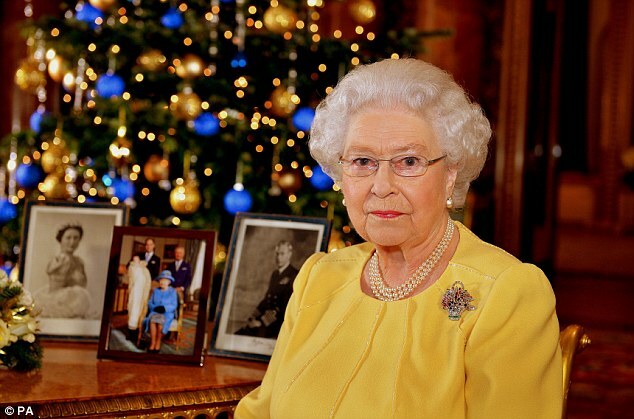 I adore the fact that the Christmas tree behind her was decorated with baubles in matching shades of blue and gold! 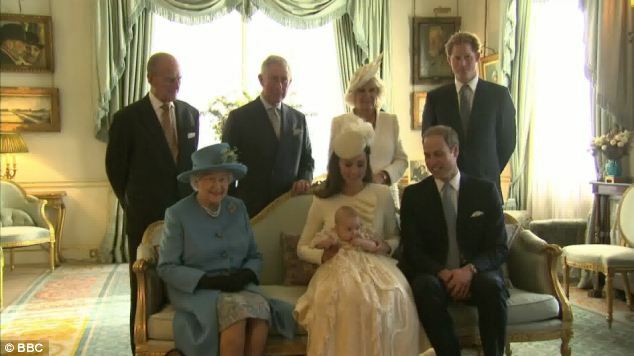 On the table beside her, framed photos of her parents, the Queen Mother and King George VI, and the iconic picture showing four generations of the Royal Family taken after Prince George's christening on 22 October 2013. (All photos from the Daily Mail unless otherwise stated; a transcript of the Queen's Christmas speech can be found here; link to the video on YouTube's Royal Channel can be found here).